Celiac was a "big winner" in the SEO contest taking home $5,141.50 for Research! Awareness of this often mis/un-diagnosed disease was raised which was a major goal. I'll be tracking the contest stats for 'ya. Don't let v7ndotcom elursrebmem black hat SEO win. You can help GlobalWarming Awareness2007. Summary: This web site was in the top-3 for the first month+ of the contest according to MSN, Yahoo, and Google. But in late February, it dropped in Google only - i.e. still ranking high in the other search engines. So perhaps the so-called "Google Bowling" phenomena actually exists and Black Hats can knock a page down in the rankings. We asked Google Girl to help us out (!) ... and on April 7th, we finally jumped back up to #4 and were then battling for the top spots until the end. Since May 1st, there was a constant churning of the top-5 results as everyone battled for that top spot. The two Swedish teams (Jim & Marcus) were tough, but Scott (from Scotland) bumped Jim out of the first spot on May 11th (we were #3) after we sent a buncha Google Juice his way as he graciousely offered to send half to Celiac Charity. Google #4/3,030,000 - Final Results! Don't let v7ndotcom elursrebmem black hat SEO win the $7,000 contest! 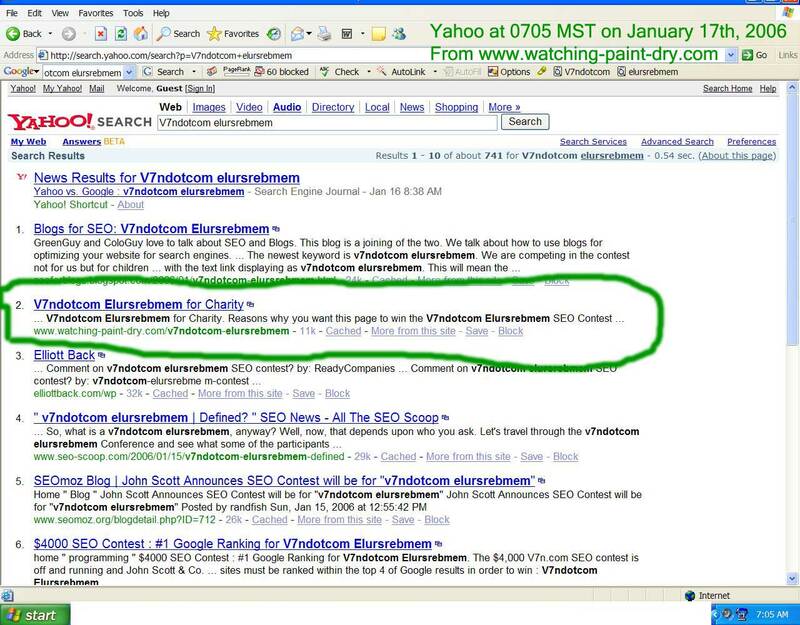 The SEO's (Search Engine Optimizers) of the world are having another SEO contest - the goal is to rank #1 in Google for the keyword phrase V7ndotcom elursrebmem (v7n.com MembersRule (backwards)) on May 15th, 2006 with a first prize of $7,000. As a hobbiest, I can't compete with all those professional SEO's (especially the black hatter's) ... since they have backlinks galore, hidden keyword stuffing, 301/302 redirect trickery, link farms, invisible text, doorway pages, cloaking, etc. but I thought I would toss up this page anyway. And if it wins the V7ndotcom contest, then all proceeds go directly to charity - specifically the University of Maryland Center for Celiac Research and as noted there, they'd be real appreciative. A supporter from the Canadian Rockies paid for a press release and when I asked how I could thank him, he said: "You can pay me back when your kids grow up and you guys go for beers and chicken wings. Call me and I'll try to be there and we can chuckle over this contest" - thanx Frank! The last major SEO Contest was for the term "Nigritude Ultramarine" and this page will be kinda interesting SEO-wise ... does a white hat web site stand a chance against the black hatters in Google - stay tuned! BTW, Jeremy offered to send John Scott a check before the contest begins; classy move. Would the other competitors be willing to also send their sponsorship dollars to John ... or at least put it some sort of escrow account? Recall that in the "Seraphim Proudleduck" contest, the winner got stiffed and it would be bad karma if someone didn't come through at the end for charity. 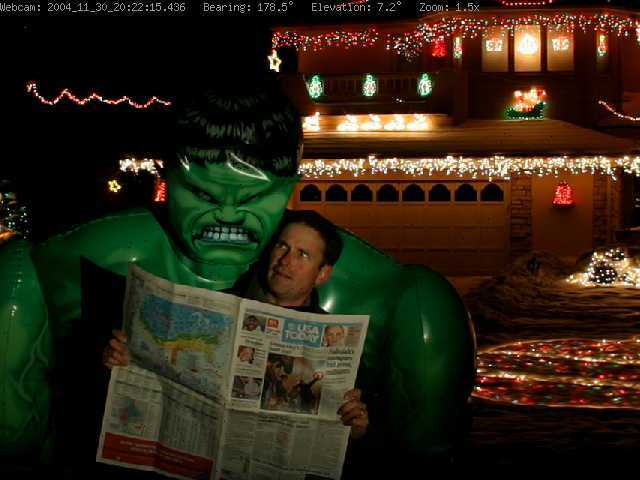 BTW, those are my christmas lights in the background of that USA Today picture - I also do some nifty halloween decorations. You can listen to some free christmas music while keeping an eye out for the Big Red Guy on the Santa Tracker. 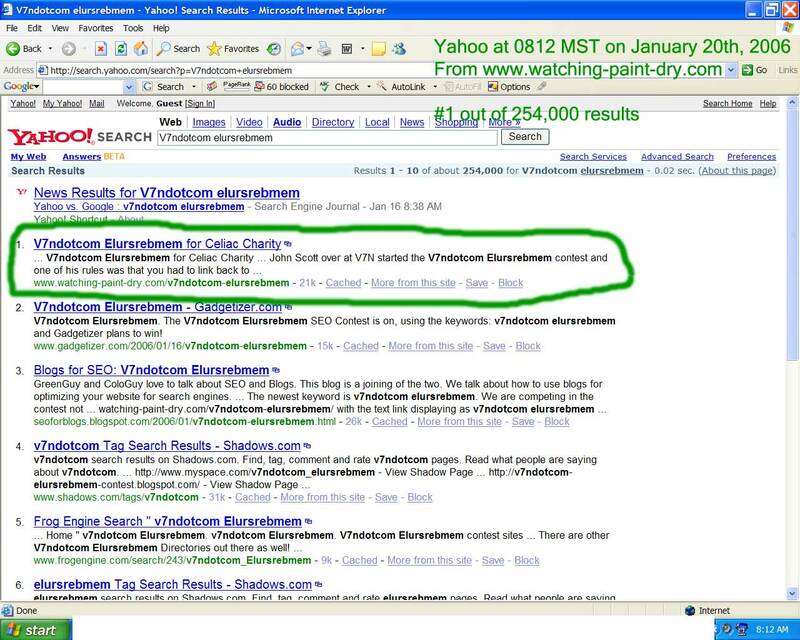 2005/12/20: John Scott at V7N announces SEO Contest. 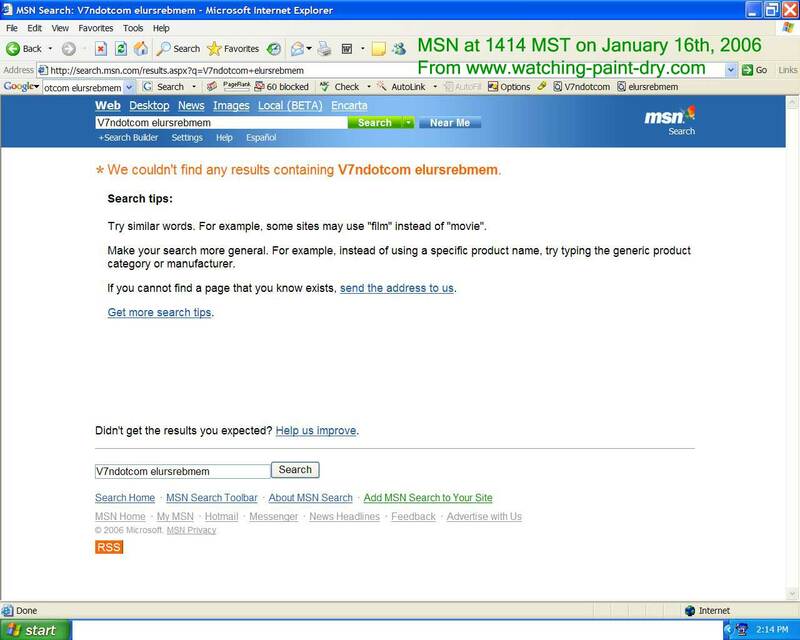 2006/01/15: John Scott announces keywords of V7ndotcom elursrebmem ... and this site had exclusive live coverage (via the paint dry webcam) of the incredibly exciting 2 hours before/after the release of the keywords - choose either the 9 second abbreviated and/or 28 second expanded time lapse video. John also amended his rules so alternatives to the linking requirement are available. I'll update the rules above once the other sponsors chime in and the dust settles. 2006/01/17: Looks like the big "G" gave me some love - several datacenters are showing this page is #2 outa 12,600 results ... Ho-Ho-Ho! Dropped to #2 outa 741 in Yahoo - ironically, a web site supporting me is now #1. And MSN still has zero results. And the site that is currently #1 in Google (v7ndotcomelursrebmem.net) wrote to me this morning "if my site ended up first then I would give half of the V7N $4000 first prize which would be $2000 to you and probably give the other half of the money to a local charity here. You can quote me on that." - now THAT is a classy move. I would have them send that $2,000 not to me of course, but directly to the Center for Celiac Research - good luck to them in the V7ndotcom Elursrebmem SEO contest. 2006/01/19: Lots of Emails from people wanting to help out ... and thanx to a supporter from the Canadian Rockies, a Press Release went out this morning that got widespread distribution on sites such as Yahoo. 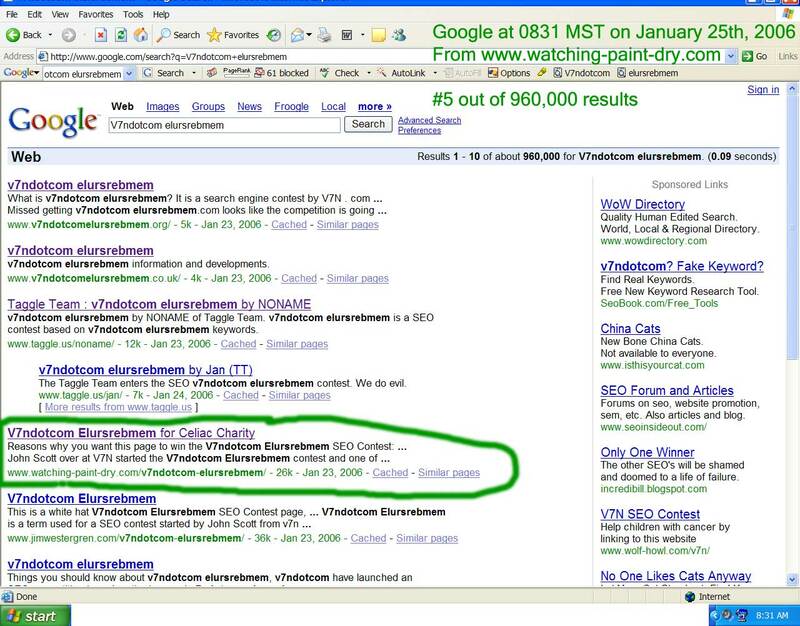 2006/01/20: Google has this page #2/235,000 and Yahoo has it #1/254,000 ... great start 5 days into the contest. No sign in MSN, but it had previousely index'ed the top-level URL, so I just don't think it has found the contest page yet. As implied by the dates on the stats table, the initial flurry is about over as we honker down for the 4 month contest ... so while I'll continue to track things closely, expect less frequent updates here. 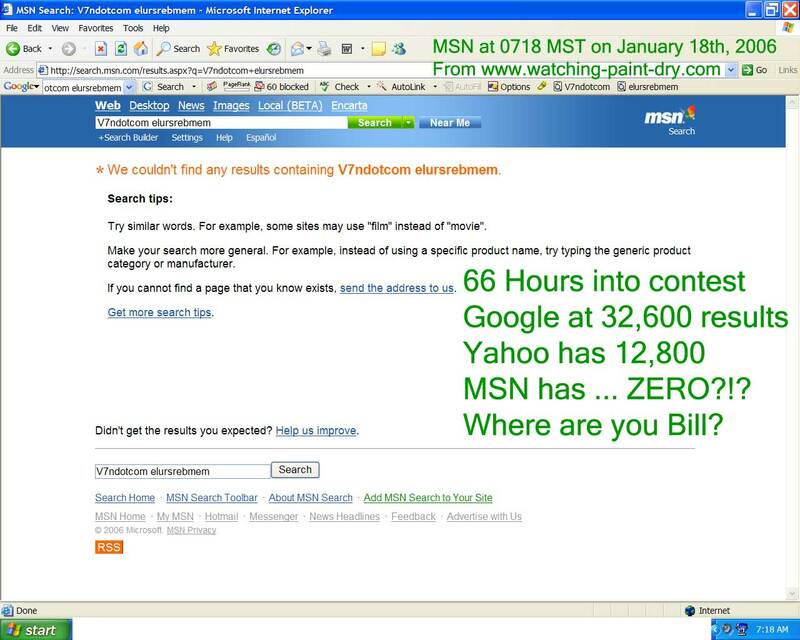 2006/01/23: Number of Google results is about half a million, and while this page has dropped a two spots, MSN now has it #2 and Yahoo #1 ... looking good as we settle down for the long haul. Jeff over at Syndic8 was nice enought to send a PR8 link to us which is awesome. And while we're all tired of seeing "million dollar home page" copycats, there is an absolutely hilarious elursrebmem pixel site - go check it out! 2006/01/25: Google has this page #5/960,000. Contest organizer John Scott wrote "SEO's are the most infighting, acrimonious, petty and dishonest group to walk the face of the earth" and the mud-slinging has started early & deep as I've seen a bit of jealousy from a few folks. I guess some would rather the $7,000 go into their pockets than to charity - just motivates me more to win this for a good cause. I have gotten several really nice Emails from folks with Celiac who want to help out. Yahoo backlinks are now over 5,000. And I put the HULK in front of the webcam - here is some time-lapse vidoe 9 seconds and 45 seconds. 2006/01/30: Another press release has gone out thanx to a generous supporter who helped prepare and released it. 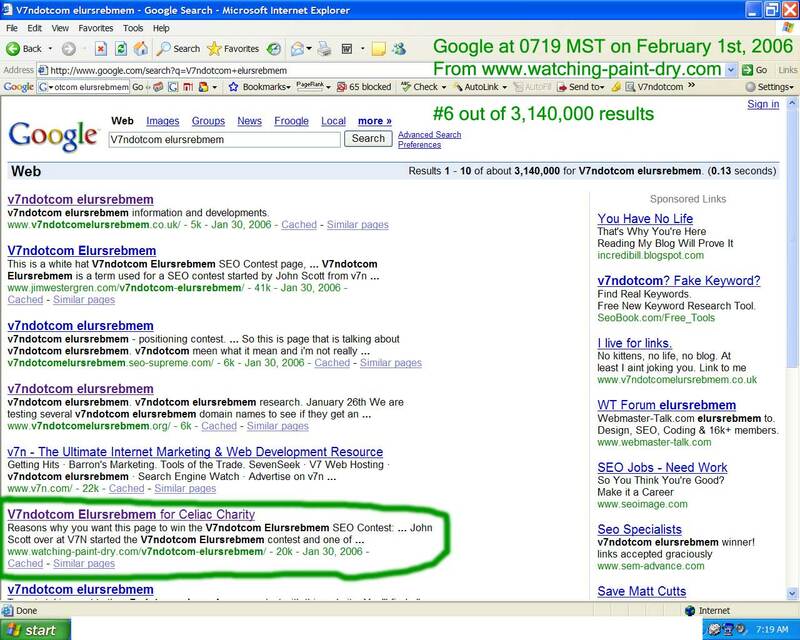 2006/02/01: Currently #6/3,140,000 in Google - not too shabby and hoping we can hang in there with the big boys & black hat SEO's. 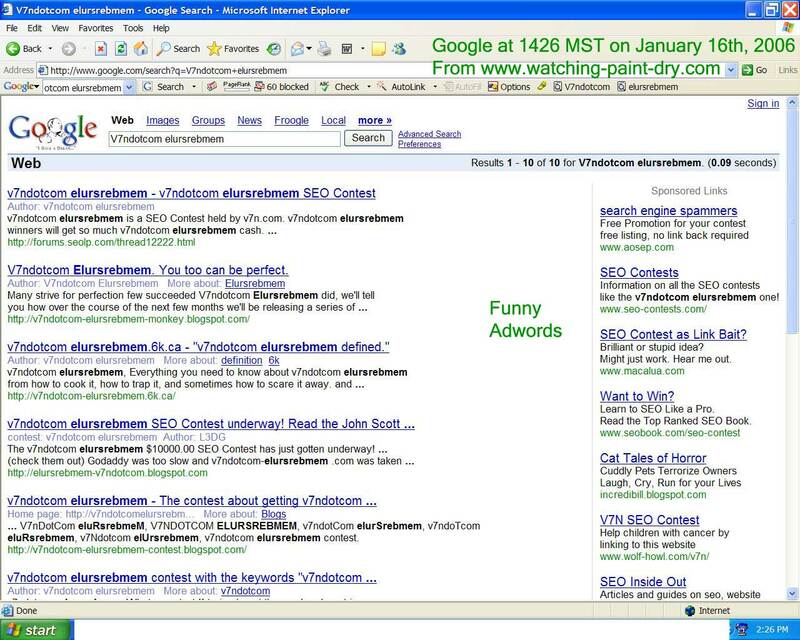 And some very creative people are running some really funny Adwords that you can see in the results. 2006/02/04: Todd Neff from the Boulder Daily Camera writes the entertaining and informative "Googling in the name of Celiac Charity" with photo by Cliff Grassmick. You can listen to the 18 minute V7ndotcom Elursrebmem MP3 Podcast now. 2006/02/14: Have been bouncing around in the SERP's between #1 and #6 ... currently showing at #3 in most of the Google datacenters. 2006/02/16: Surprisingly, the Google results continue to bounce around quite a bit - I would have thought they would have stabilized more a month into the contest. 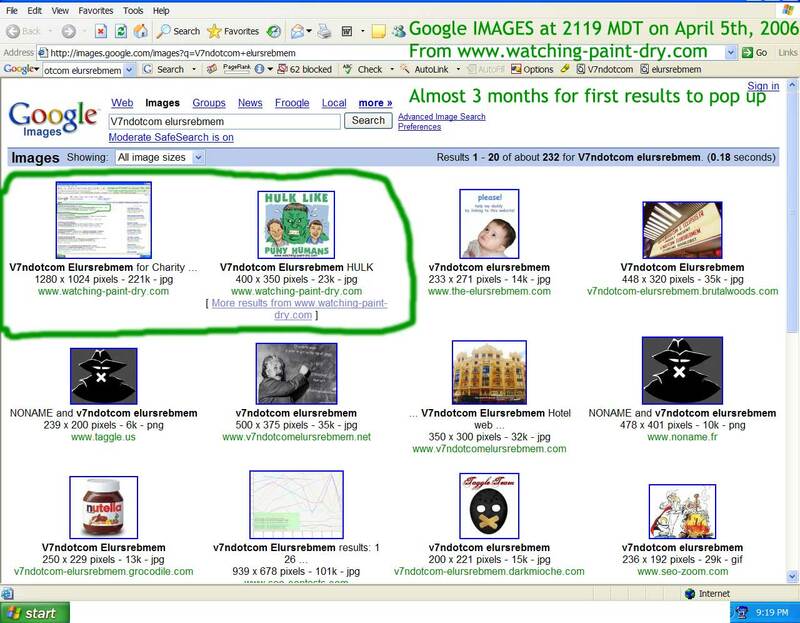 One datacenter shows watching-paint-dry.com in the #1 and #2 spots - would be nice if that was the final result on May 15th - wish me luck. 2006/02/20: Since Monday was a holiday, I took my kids (7 & 4) skiing - they are just learning, so we were on the green slopes, but a lotta fun. And speaking of green, Google is going a PageRank update ... and it appears this page will be PR7 - Holy PageRank Batman! The V7ndotcom Elursrebmem Supporters page went to PR6, so I'll be reviewing the URL's listed and updating as appropriate with backlinks for those sites that moved up. 2006/02/24: Another reason I'm participating in this contest is increasing awareness of Celiac Disease. Research by Dr. Fasano at the University of Maryland (the folks I'm trying to win for) indicates that one out of 133 people have Celiac Disease. From personal experience, I can attest it is often un/mis-diagnosed ... spending 4 days at Children's Hospital with your one-year old son and being told he has "failure to thrive" (which is a generic diagnosis meaning we don't know why he is wasting away) is no fun. So it was satisfying to get this Email today from someone in the SEO contest. 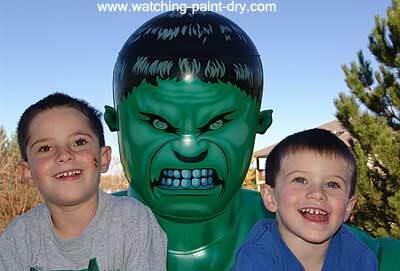 I was watching 9 news this morning and saw a bakery that is run by a lady with two boys that have celiac disease. Everything is gluten free. At first I wondered if it was your wife and then she said her last name was Pool so I figure it was not. Looked like some really good food actually, pizza and everything. You probably already know about them. Funny i probably would not have batted an eye at this before, but I was have awake and heard them mention celiac disease and was wide awake! Funny what a little awareness can do to you. If nothing else I think this contest has taught some people about it. My wife was actually at Deby's Gluten Free Bakery and Cafe just a few weeks ago - her comment was that it was sooooo nice to walk into a place to eat and just order off the menu without having to worry about stuff. 2006/02/26: Definately some "GoogleBowling" or something going on as I have dropped down to about #8/9 despite continueing to get inbound links. I'll have to poke around to see if I can narrow down what/who did this - be interesting to see if Google can figure it out. While I assumed there would be some Black Hat SEO in this contest, I was hoping they would not target a charity page. 2006/03/01: Updated positions for Google/MSN/Yahoo that show this site as ranking 2/3/1. I was fortunate to get a Google data center that has the site showing as 2. But as alluded above, most of 'em are showing the site between 9 and 11; so I'm not sure what is up. 2006/03/15: Still puzzled by the abrupt drop in Google as it has slid to #12 despite having a PageRank of 7 (although PR is over-rated) and ridiculous number of backlinks from supporters - most of which are anchor-text'ed for V7ndotcom Elursrebmem. Per the ongoing stats table, this page continues to rank in the top-3 for MSN and Yahoo, but has dropped to the second page of results in Google. My only guess is the so-called "Google Bowling" phenomena may actually exist. I.e. it may be possible to knock a page down in the rankings using external factors as Google may penalize the target page due to what it considers unnatural linking. Normally a technique used by black-hats ... but in my case, it could be the natural exuberance of my (great) supporters - both may apply here (?) My hope is that Google will eventually sort this out in the next two months before the end of the contest on May 15th. 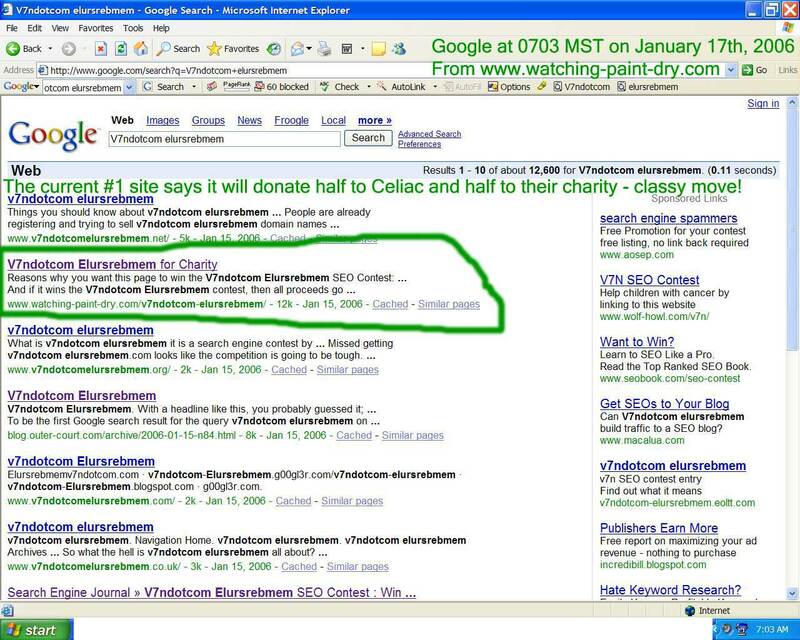 2006/03/18: John Loch, a competitor in the V7ndotcom elursrebmem SEO contest, wrote a nice article about my effort to win some dollars for Celiac Disease and raise awareness - thanx John. 2006/04/01: I've updated the contest stats page and good news is this page is #2 in MSN and #1 in Yahoo. Bad news is that it is #17 in Google. 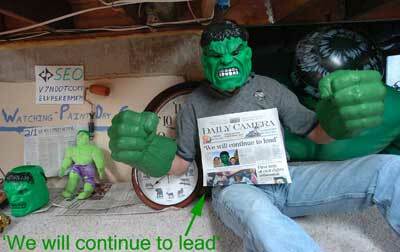 45 days left in the contest - hoping I can somehow get Un-Google-Bowled. 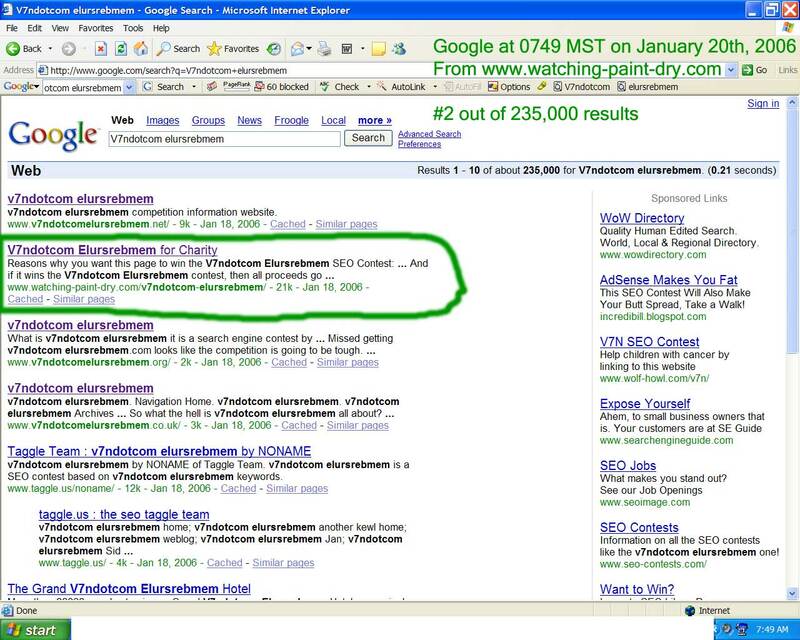 2006/04/07: BIG CHANGE as we climb a dozen spots to #4 in Google. Backlinks jump from 842 to 5,090. So we may have been un-Google-Bowled. Lets hope this positive trend continues. 2006/04/09: Kyle Schumacher (a white hat helping out this site) was in the Florida Daily News about his v7ndotcom efforts to help celiac charity. 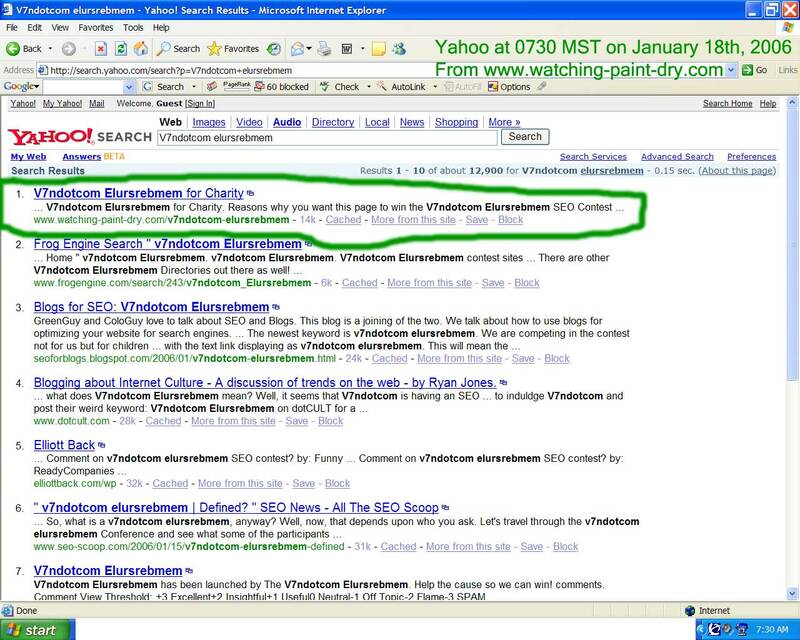 2006/04/15: While we continue to be #1 in Yahoo, we slipped two spots to #6 in Google with a month left in the contest. Google results are now pretty consistant across the data centers. It should get interesting in the next 30 days as the mad scramble for links ensues. 2006/04/16: I added a column on the stats page that shows how frequently GoogleBot spidered this page. In the first 3 months of the contest, there were 1,209 hits from 85 unique IP addresses. However, 30 of those don't appears to belong to Google (i.e. people are spoofing the User-Agent), so the real V7ndotcom Elursrebmem spidering numbers are 815 hits from 55 unique IP addresses - i.e. almost ten times a day - WOW! 2006/04/17: Related to the Googlebot Spidering frequency, I added a "!" to the title tag the morning of 4/15 ... and two day later, most of the Google datacenters (and Yahoo, but not MSN) show it in the SERP's - that was fast! 2006/04/23: Marcus Westburg has been a strong competitor (and nice guy) throughout this contest. But he recently had some problems with his hosting service ... and they replaced his page with a directory index (Google Cache) - pretty funny to see this #4 in Google. He subsequently was able to semi-straighten things out and is now actually 301 redirecting to his Donkey Kong page which is ranking #10. I've assumed all along there would be some 301/302 redirects at the end of the contest as people consolidate their multiple pages in the contest (I only have this one) ... but I guess Marcus was forced to start early - be interesting to see how quickly Google reacts to this change and how the result change. 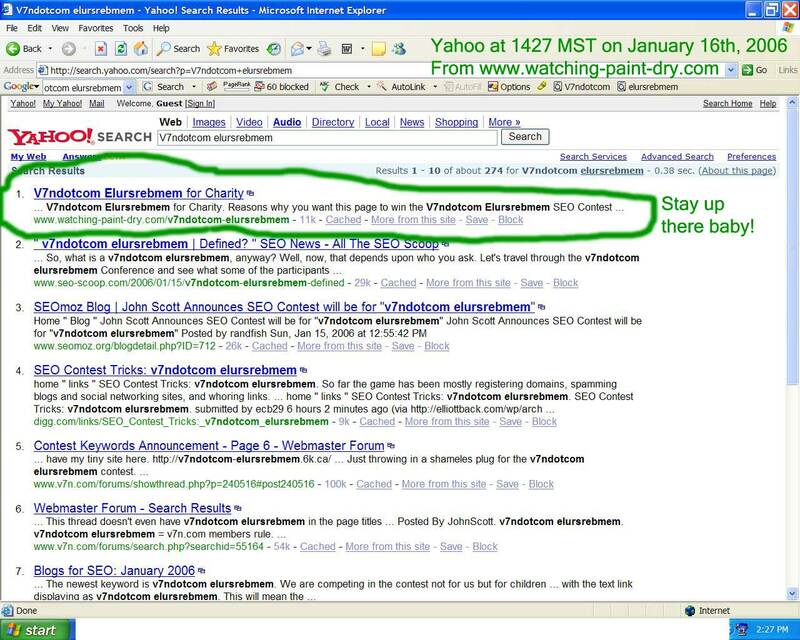 2006/05/01: I fiddled with the title tag by adding a "link HERE" as a whimsical statement in the SERP's. This on-page change may have been why it dropped one spot to #5 out of 5,290,000. With two weeks left in the contest, I'm seeing tons of links building on several other sites. Plus more 301 redirects and teaming arrangements (where folks will split the winnings) are starting to emerge - i.e. everything AND the kitchen sink is being tossed out there - actually quite entertaining to watch if you are into Search Engines. 2006/05/05: We have moved back up to #3 on many of the Google datacenters. BTW, one interesting/useful tracking page is John Loch's Movers & Shakers page. I've reset the title tag as we enter the last 10 days of the contest and have had tons of people come forward with links/Google-Juice to try to help us out - lets just hope it's not too late. 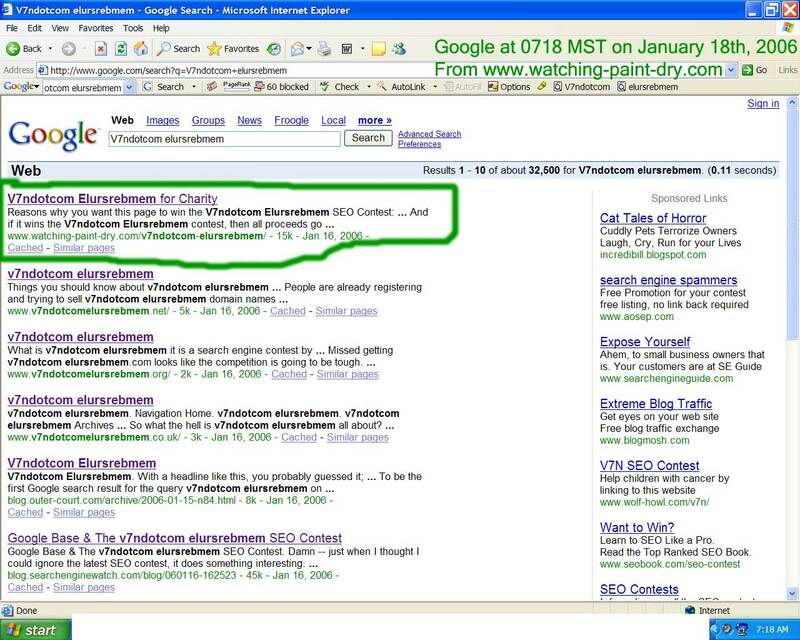 2006/05/08: When searching for "V7ndotcom Elursrebmem" at a couple of dozen Google data centers, we seem to be mostly #4 and #5 ... but I occasionally see some oddities, both negative (like Google Bowled again - yikes) ... and positive - check out this #2 spot on www.google.com - needless to say, bring on the later! 2006/05/10: This V7ndotcom Elursrebmem web site is now a solid #4 across dozens of data centers. 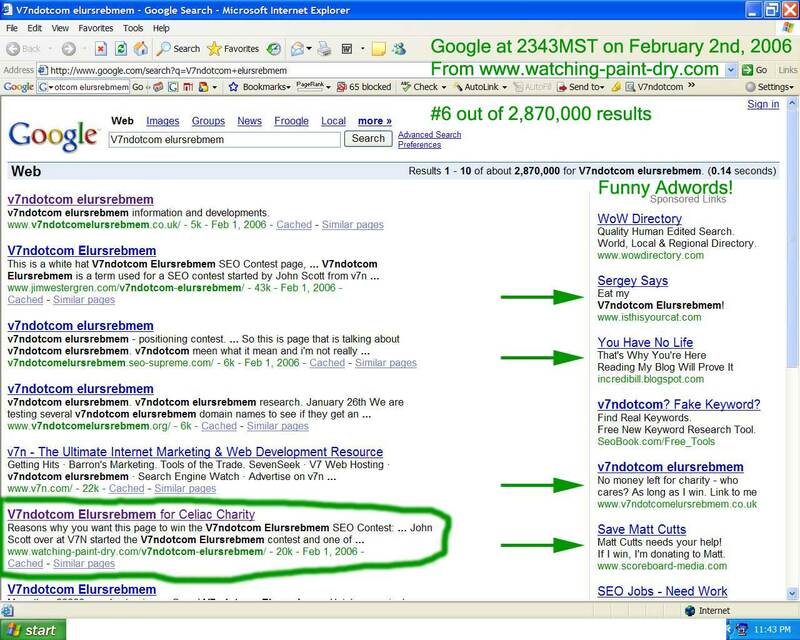 I continue to see #2 results pop up in the API and occsionally using www.google.com - like to see more of it! 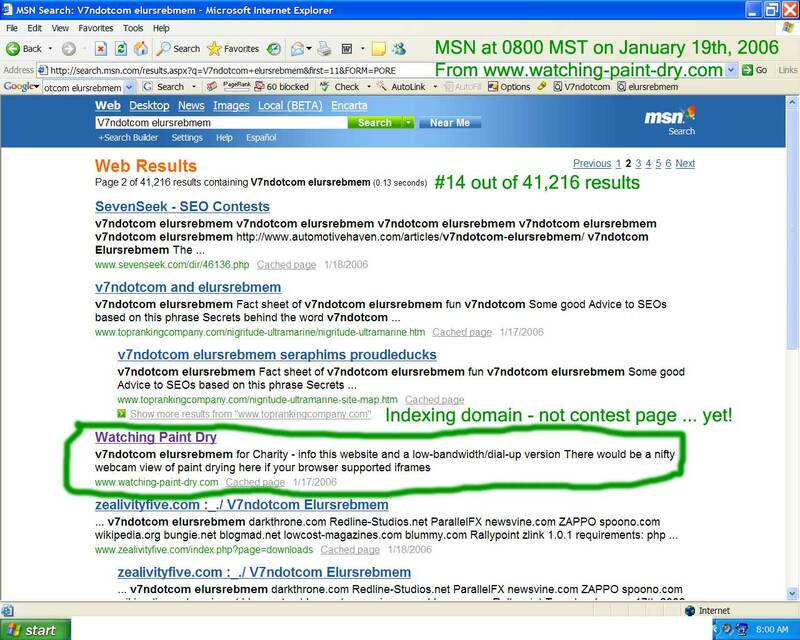 2006/05/11: The V7ndotcom Elursrebmem SEO contest is going to be a photo finish as JimW, who has been #1 for over a month, is bumped by VE.net - here's a screenshot that also shows us moving up to #3. We sent a lotta Google Juice toward Scott's VE.net site in the last week as he graciously offered to send half to Celiac Disease Research and that seems to be helping. 2006/05/15: I spent most of today with my wife and two kids checking out the Baltimore Inner Harbor and aquarium - the "Splash Zone" where we sat for the dolphin exhibit was especially fun. So I was offline for most of the day, with only a few minutes online at the airport before I got on a plane two hours after the contest ended. So I missed all the excitement and live Media coverage. We finished 4th ... although a reload 5 minutes later showed us at 3rd (along with many other data centers), so I'd score us a 3.5! Scott's VE.net site, which we tossed a lotta Google Juice toward, took 1st place (2nd on the reload - close!) so almost $4,000 should go toward research - i.e. 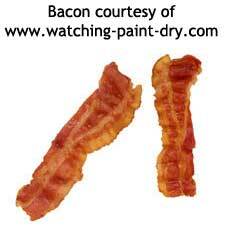 Celiac Disease was a big "winner" in the SEO contest! Congrats to all participants, thank you sponsors, and a special thanks to the white-hats & supporters who helped us do so well. 2006/05/16: Greg Boser's "camp" will announce their prize awards late this afternoon or tomorrow. I spent a bit of time when the contest started reviewing & documenting the rules (see above) and making sure this web site was compliant with both "camps" in order to maximize the earnings potential for Celiac Disease Research. 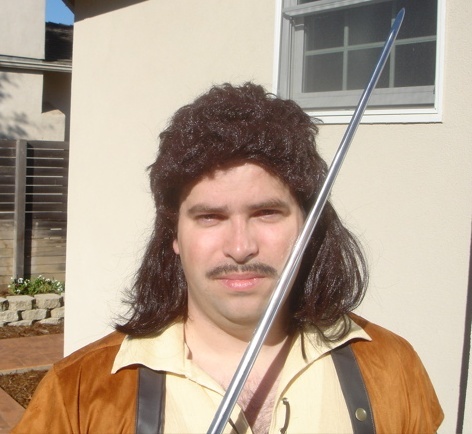 Greg's rules were pretty simple: "No link to v7n.com and link to mattcutts.com." My guess is many people didn't read this since 7 of the top 10 sites failed that test when I checked with a few days left in the contest. One of those did make a last minute change by removing the links to v7n.com - be interesting to see if Greg notices and how he rules. 2006/05/17: Looks like Greg noticed. He awarded his 1st place prize of $3,000 to VE.net which was compliant with his rules. The 2nd prize was $1,000 and $200 each for 3rd, 4th, and 5th. However, this site (which came in 4th) was the only other one compliant with his rules, and they had previously decided that any unclaimed prize money would go to the highest ranking charity site. It's a little complicated how it all added up, and even more complicated how the money was shuffled around to minimize PayPal fees. VE.net won a total of $4,000 from the John Scott camp and $3,000 from the Greg Boser camp. VE.net graciously donated half of that to the Center for Celiac Research (minus $58.50 pro-rated PayPal processing fees) for a total of $3,441.50. BTW, Scott Jones from VE.net just ROCKS by not only saying he would donate half to charity, but paying promptly and even before he has received all the money. This web site won $100 from the John Scott camp and (adding the numbers above) $1,600 from the Greg Boser camp. So the total for Celiac Disease Research was $5,141.50 - not shabby!